The Level One Trauma Center at Robert Wood Johnson University Hospital (RWJUH) and Safe Kids Middlesex County held its 6th Annual Recognition Luncheon on December 15th in the Arline and Henry Schwartzman Courtyard. The well-attended event was led by Tim Murphy, Director of the Department of Trauma and Injury Prevention, and Diana Starace, Coordinator, Injury Prevention and Safe Kids Middlesex County. The event highlighted 2009’s outreach achievements and culminated with the presentation of outstanding service awards. 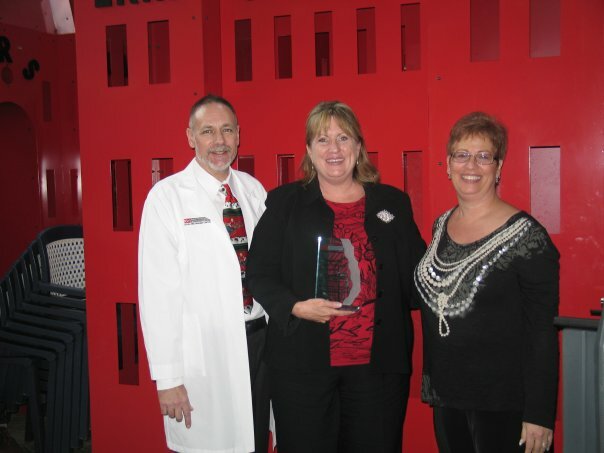 Carol Ann Giardelli (center) accepts the Outstanding Prevention Advocate Award.